Team 9778 Chinchillas returned to the state FTC competition in Lubbock for the fourth time. This year they walked away with the first place Inspire Award and a ticket to the World FTC Championship in Houston TX. 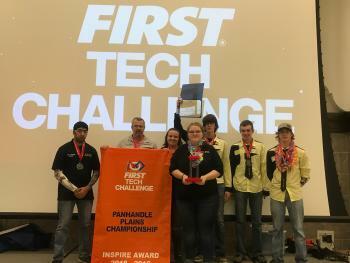 The Inspire Award is awarded to the top team that demonstrates gracious professionalism, and a detailed timeline of the teams engineering process from start to finish. This award is extremely competitive and requires professional and organizational team building skills. 9778 Chinchillas will travel to Houston in April to compete at the World FTC Championship.